There are a few places around our neighborhood that I can rely on for a delicious meal, like QQ Sushi, Shabu Shabu, La Bruschetta, and Nur. Another of these places is Academie der schönsten künste. And so on the day after Christmas, with three family members sick at home and with me not feeling much like cooking after our Christmas Eve snacks and large roast dinner on Christmas day, my mother-in-law, sister-in-law, and I decided to have a ladies lunch. Even though businesses shut down by law between the 24th and the 26th, restaurants are allowed to stay open. As such, Academie was packed. Still we were able to squeeze in for a table. 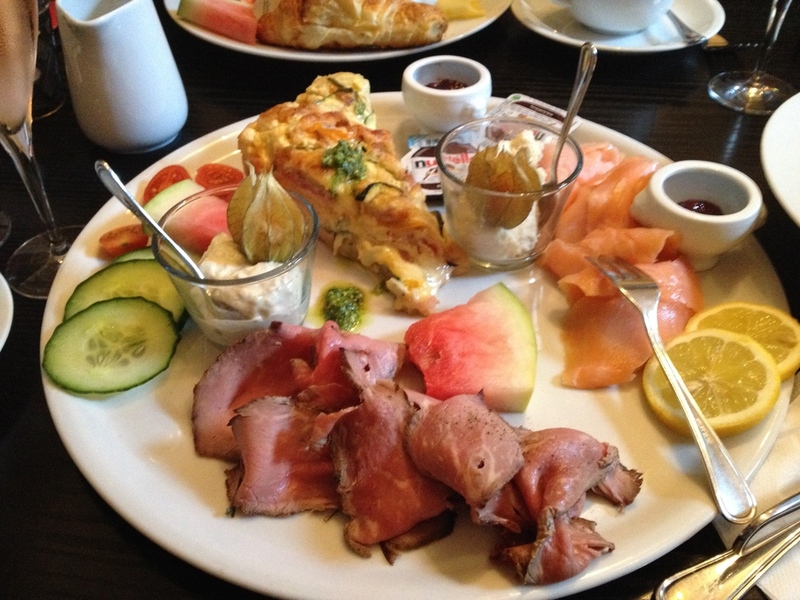 My favorite breakfast platter at Academie with quiche, roast beef, smoked salmon, fruit, and bread -- it easily feeds two people! I've been to Academie a couple of times for breakfast. They have a rather extensive menu, and a really delicious platter with cold meats, cheeses, fruit, eggs, and breads that I like. They also make some pretty decent coffee and have a lovely (though small) selection of cakes and pastries for after a meal or for a mid-day snack. The atmosphere is also super cozy, and I like the Belle Époque/eclectic feel of the interior. They have tons of reproduction Lautrec posters, old bottles lining the walls, cushions to sit on, and an artsy skeleton of a mermaid hanging from the ceiling. The restaurant spans several rooms on the ground floor of the building in addition to an outdoor patio in the rear shaded by trees in the summertime. On this particular visit, not wanting breakfast and having never tried their flammkuchen (a kind of thin-crust Alsatian pizza), which they advertise as being Stuttgart's best, I decided to go for lunch and try the Classic flammkuchen with onions and bacon. I haven't had flammkuchen from many sit-down restaurants in Stuttgart, but this one was definitely the best one of those that I've had. The thin crust was cooked to crispy perfection, and the sauce was creamy with just a hint of paprika. They were rather generous with the bacon and the onions, so each bite had the perfect balance of ingredients. My sister-in-law also got a flammkuchen: the Rustica with mushrooms and fresh cheese. We shared a slice and agreed the combination was also delicious. Academie also has a complete menu with other traditional fair and an excellent specials menu that changes with the season. My mother-in-law decided to try the goose liver sautéed in a port wine sauce with salad and lovely pearled-shapped Parisiane potatoes sauteed in butter. I didn't try the dish, but she raved about it. Sadly, we didn't have enough time for coffee and cake on this visit, as the restaurant was starting to get even busier and we were being called away by our husbands who were feeling better and ready to take in some fresh air with us. We had had a very yummy lunch together, making it a good place to spend our afternoon. Leo was even able to join us without any problem. Note that the menus at Academie only come in German, but several of the staff spoke excellent English and our waiter was thrilled to practice his English with my in-laws. My only word of warning is that service has sometimes been hit or miss for me there. They've been busy on all the visits I've made, and so every time (including this one) we've had to flag down a rushing waiter for our check or for drink refills. While not a deal-breaker, this can get a bit annoying if you're in a hurry. Academie is located on Charlottenstraße 5 just between the Charlottenplatz and Olgaeck U-bahn stations. They are open from 7:00 am until midnight on weekdays, and from 9:00 am until midnight/7:00 pm on Saturday and Sunday (respectively). Make sure you call ahead and reserve a table for large groups or special occasions.